Our Mexican Coffee Recipe Will Delight You! Make our Mexican coffee recipe the next time you want something to warm you up on a chilly night. Or serve this for an after dinner treat. Your guests will love it. This recipe tastes rich, chocolatey, and decadent. It contains coffee and I recommend using a good one, cinnamon, light brown sugar instead of white (for enhanced flavor), milk, Ghiradelli hot chocolate mix, vanilla extract, heavy whipping cream, and Kahlua, which is totally optional. To top it all off I like to use real whipping cream. Not the stuff that comes in a can that you spray out. Yuck. It only takes a few minutes to whip up the real deal. And it tastes so much better, it’s not even comparable. And you know what else? I learned something new today regarding real whipped cream. When you whip it up with sugar and vanilla extract it’s called creme chantilly. Did you know that? Or did I teach you something new too? I’ve whipped up whip cream this way my whole life because, well that’s just how you do it because it tastes so darn good. I can’t even imagine it without sugar and vanilla extract. My goal with this Mexican drink was to make it as easy as possible so you would have no hesitation making it. So let’s get started so you can get to enjoying it. In a mixing bowl, add the heavy whipping cream and begin to mix with a hand mixer on high speed. Add 1/2 tsp vanilla and some of the powdered sugar. Gradually add the rest of the sugar and mix until you have stiff peaks. Keep chilled. Set up your coffee maker to make 4 cups of coffee. I recommend you use a quality coffee, either regular or decaf. For example I use Pete’s coffee. Now I don’t like my coffee particularly strong so I use between 1 to 1 and 1/2 tablespoons per cup even though the package says to use 2 tablespoon per cup. It’s just too strong for me. Place the coffee in your filter and add the cinnamon too. Use filtered water and make your 4 cups. While the coffee is percolating, grab a sauce pan big enough to hold all the coffee plus the milk. In the sauce pan add the milk, brown sugar, and the Ghiradelli chocolate. Stir over medium heat until everything is dissolved and hot but don’t let it boil. Pour the coffee into the sauce pan with the milk mixture. Add the vanilla extract and Kahlua if you are adding that and stir until combined. At this point grab a spoon and have a taste. This is the point where you can tweak the Mexican coffee recipe if you want. You might find you want a little more chocolate or brown sugar or cinnamon. If you like what you taste, find a nice mug and pour some in. Don’t fill it to the top though. Leave about an inch for that delicious rich whipping cream. You can dust the whipping cream with more cinnamon or nutmeg if it suits your fancy or leave it plain. Kick up your feet and enjoy the moment. 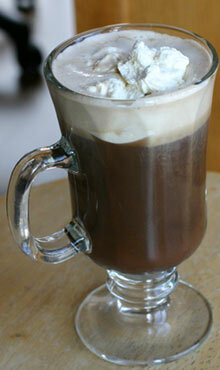 Our Mexican coffee recipe is a perfect ending to a delicious Mexican dinner. If you would like to pick up some of the mugs I use for this recipe, click here. Return from Mexican Coffee Recipe To More Mexican Food Recipes. Click here if you are looking for more drink recipes. Click here to watch my Mexican Coffee video.